One of the most widely used continuous cell lines for virology is the HeLa cell line, which was derived in 1951 from Henrietta Lacks. What is the origin of this amazing cell line? In early 1951, Ms. Lacks, a 31-year old mother of five children, was found to have a malignant tumor of the cervix. During her examination at Johns Hopkins Hospital in Baltimore, MD, a sample of the tumor was removed and provided to Dr. George Gey. He was head of tissue culture research at Hopkins who for years had been attempting to produce a line of immortal human cells. When Ms. Lacks died in October 1951, Dr. Gey announced on national television that he had produced from Ms. Lacks’ tumor a line of cells that propagated as no other cells ever had before. He called them ‘HeLa’ cells in her honor, and showed a vial of the cells to the television audience. HeLa cells have since been used in many laboratories all over the world to make countless research discoveries. For example, shortly after Dr. Gey announced the HeLa cell line, it was used to propagate poliovirus, an event that played an important role in the development of poliovirus vaccines. But Ms. Lacks’ family never learned about the important cells that were derived from her until 24 years after her death. The history of this event, described in the Johns Hopkins Magazine, is a commentary on the lack of informed consent common in medical research at the time. My laboratory uses HeLa cells for propagating and studying many different viruses. 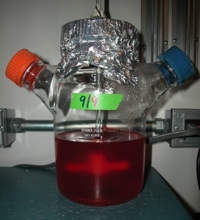 We have maintained the cells in suspension cultures (pictured) since 1983. Over the course of 26 years, 600,000,000 HeLa cells have been produced in my laboratory each week, for a total of 800 billion cells. That is a lot of cells, but it’s nothing compared with the total number of cells – approximately 100 trillion – that make up a human.